Traumatic brain injury (TBI, also called intracranial injury) occurs when an outside force traumatically injures the brain. TBI can be classified based on severity, mechanism (closed or penetrating head injury), or other features (e.g. occurring in a specific location or over a widespread area). Head injury usually refers to TBI, but is a broader category because it can involve damage to structures other than the brain, such as the scalp and skull. TBI is a major cause of death and disability worldwide, especially in young people. Causes include falls, vehicle accidents, sports, and violence. Prevention measures include use of technology to protect those who are in accidents, such as seat belts and sports or motorcycle helmets, as well as efforts to reduce the number of accidents, such as safety education programs and enforcement of traffic laws. TBI can cause a host of physical, cognitive, emotional, and behavioral effects, and outcome can range from complete recovery to permanent disability or death. The 20th century has seen critical developments in diagnosis and treatment which have decreased death rates and improved outcome. These include imaging techniques such as computed tomography and magnetic resonance imaging. Depending on the injury, treatment required may be minimal or may include interventions such as medications and emergency surgery. Physical therapy, speech therapy, and occupational therapy may be employed for rehabilitation. Traumatic brain injury is defined as damage to the brain resulting from external mechanical force, such as rapid acceleration or deceleration, impact, blast waves, or penetration by a projectile. Brain function is temporarily or permanently impaired and structural damage may or may not be detectable with current technology. TBI is one of two subsets of acquired brain injury (brain damage that occurs after birth); the other subset is non-traumatic brain injury, which does not involve external mechanical force (examples include stroke and infection). All traumatic brain injuries are head injuries, but the latter term may also refer to injury to other parts of the head. However, the terms head injury and brain injury are often used interchangeably. Similarly, brain injuries fall under the classification of central nervous system injuries and neurotrauma. In neuropsychology research literature, the term "traumatic brain injury" generally is used to refer to non-penetrating traumatic brain injuries. Head injuries can be classified into mild, moderate, and severe categories. The Glasgow Coma Scale (GCS), a universal system for classifying TBI severity, grades a person's level of consciousness on a scale of 3–15 based on verbal, motor, and eye-opening reactions to stimuli. It is generally agreed that a TBI with a GCS of 13 or above is mild, 9–12 is moderate, and 8 or below is severe. Similar systems exist for young children. Other classification systems such as the one shown in the table determine severity based on the GCS after resuscitation, the duration of post-traumatic amnesia (PTA), loss of consciousness (LOC), or combinations thereof. It is also possible to classify TBI based on prognosis or indicators of damage visible with neuroimaging, such as mass lesions and signs of diffuse injury. Grading scales also exist to classify the severity of mild TBI, commonly called concussion; these use duration of LOC, PTA, and other concussion symptoms. Systems also exist to classify TBI by its pathological features. Lesions can be extra-axial, (occurring within the skull but outside of the brain) or intra-axial (occurring within the brain tissue). Damage from TBI can be focal or diffuse, confined to specific areas or distributed in a more general manner, respectively. However it is common for both types of injury to exist in a given case. Diffuse injury manifests with little apparent damage in neuroimaging studies, but lesions can be seen with microscopy techniques post-mortem. Types of injuries considered diffuse include concussion and diffuse axonal injury, widespread damage to axons in areas including white matter and the cerebral hemispheres. Focal injuries often produce symptoms related to the functions of the damaged area, manifesting in symptoms like hemiparesis or aphasia when motor or language areas are respectively damaged. One type of focal injury, cerebral laceration, occurs when the tissue is cut or torn. In a similar injury, cerebral contusion (bruising of brain tissue), blood is mixed among tissue. In contrast, intracranial hemorrhage involves bleeding that is not mixed with tissue. Hematomas, also focal lesions, are collections of blood in or around the brain that can result from hemorrhage. Intracerebral hemorrhage, with bleeding in the brain tissue itself, is an intra-axial lesion. Extra-axial lesions include epidural hematoma, subdural hematoma, subarachnoid hemorrhage, and intraventricular hemorrhage. Epidural hematoma involves bleeding into the area between the skull and the dura mater, the outermost of the three membranes surrounding the brain. In subdural hematoma, bleeding occurs between the dura and the arachnoid mater. Subarachnoid hemorrhage involves bleeding into the space between the arachnoid membrane and the pia mater. Intraventricular hemorrhage occurs when there is bleeding in the ventricles. Unequal pupil size is a sign of a serious brain injury. A person with a moderate or severe TBI may have a headache that gets worse or does not go away, repeated vomiting or nausea, convulsions, an inability to awaken, dilation of one or both pupils, slurred speech, weakness or numbness in the limbs, loss of coordination, and increased confusion, restlessness, or agitation. Small children with moderate to severe TBI may have some of these symptoms but have difficulty communicating about them. Other signs seen in young children include persistent crying, inability to be consoled, listlessness, refusal to nurse or eat, and irritability. The most common causes of TBI include violence, transportation accidents, construction, and sports. In the US, falls account for 28% of TBI, motor vehicle (MV) accidents for 20%, being struck by an object for 19%, violence for 11%, and non-MV bicycle accidents for 3%. Bicycles and motor bikes are major causes, with the latter increasing in frequency in developing countries. The estimates that between 1.6 and 3.8 million traumatic brain injuries each year are a result of sports and recreation activities in the US. In children aged two to four, falls are the most common cause of TBI, while in older children bicycle and auto accidents compete with falls for this position. TBI is the third most common injury to result from child abuse. Abuse causes 19% of cases of pediatric brain trauma, and the death rate is higher among these cases. Domestic violence is another cause of TBI, as are work-related and industrial accidents. Firearms and blast injuries from explosions are other causes of TBI, which is the leading cause of death and disability in war zones. The type, direction, intensity, and duration of forces all contribute to the characteristics and severity TBI. Forces that may contribute to TBI include angular, rotational, shear, and translational forces. Even in the absence of an impact, significant acceleration or deceleration of the head can cause TBI; however in most cases a combination of impact and acceleration is probably to blame. Forces involving the head striking or being struck by something, termed contact or impact loading, are the cause of most focal injuries, and movement of the brain within the skull, termed noncontact or inertial loading, usually causes diffuse injuries. The violent shaking of an infant that causes shaken baby syndrome commonly manifests as diffuse injury. In impact loading, the force sends shock waves through the skull and brain, resulting in tissue damage. Shock waves caused by penetrating injuries can also destroy tissue along the path of a projectile, compounding the damage caused by the missile itself. Secondary injury events include damage to the blood–brain barrier, release of factors that cause inflammation, free radical overload, excessive release of the neurotransmitter glutamate (excitotoxicity), influx of calcium and sodium ions into neurons, and dysfunction of mitochondria. Injured axons in the brain's white matter may separate from their cell bodies as a result of secondary injury, potentially killing those neurons. Other factors in secondary injury are changes in the blood flow to the brain; ischemia (insufficient blood flow); cerebral hypoxia (insufficient oxygen in the brain); cerebral edema (swelling of the brain); and raised intracranial pressure (the pressure within the skull). Intracranial pressure may rise due to swelling or a mass effect from a lesion, such as a hemorrhage. As a result, cerebral perfusion pressure (the pressure of blood flow in the brain) is reduced; ischemia results. When the pressure within the skull rises too high, it can cause brain death or herniation, in which parts of the brain are squeezed by structures in the skull. The preferred radiologic test in the emergency setting is computed tomography (CT): it is quick, accurate, and widely available. Followup CT scans may be performed later to determine whether the injury has progressed. Magnetic resonance imaging (MRI) can show more detail than CT, and can add information about expected outcome in the long-term. It is more useful than CT for detecting injury characteristics such as diffuse axonal injury in the longer term. However, MRI is not used in the emergency setting for reasons including its relative inefficacy in detecting bleeds and fractures, its lengthy acquisition of images, the inaccessibility of the patient in the machine, and its incompatibility with metal items used in emergency care. Other techniques may be used to confirm a particular diagnosis. X-rays are still used for head trauma, but evidence suggests they are not useful; head injuries are either so mild that they do not need imaging or severe enough to merit the more accurate CT. Angiography may be used to detect blood vessel pathology when risk factors such as penetrating head trauma are involved. Functional imaging can measure cerebral blood flow or metabolism, inferring neuronal activity in specific regions and potentially helping to predict outcome. Electroencephalography and transcranial doppler may also be used. Neuropsychological assessment can be performed to evaluate the long-term cognitive sequels and to aid in the planning of the rehabilitation. Instruments range from short measures of general mental functioning to complete batteries formed of different domain-specific tests. Protective sports equipment such as helmets can protect athletes from head injury. Changes to common practices in sports have also been discussed. An increase in use of helmets could reduce the incidence of TBI. Due to the possibility that repeatedly "heading" a ball practicing soccer could cause cumulative brain injury, the idea of introducing protective headgear for players has been proposed. Improved equipment design can enhance safety; softer baseballs reduce head injury risk. Rules against dangerous types of contact, such as "spear tackling" in which the American football tackled player hits the ground head first, may also reduce head injury rates. People with moderate to severe injuries are likely to receive treatment in an intensive care unit followed by a neurosurgical ward. Treatment depends on the recovery stage of the patient. In the acute stage the primary aim of the medical personnel is to stabilize the patient and focus on preventing further injury because little can be done to reverse the initial damage caused by trauma. Rehabilitation is the main treatment for the subacute and chronic stages of recovery. International clinical guidelines have been proposed with the aim of guiding decisions in TBI treatment, as defined by an authoritative examination of current evidence. Neuroimaging is helpful but not flawless in detecting raised ICP. A more accurate way to measure ICP is to place a catheter into a ventricle of the brain, which has the added benefit of allowing cerebrospinal fluid to drain, releasing pressure in the skull. Treatment of raised ICP may be as simple as tilting the patient's bed and straightening the head to promote blood flow through the veins of the neck. Sedatives, analgesics and paralytic agents are often used. Hypertonic saline can improve ICP by reducing the amount of cerebral water (swelling), though it is used with caution to avoid electrolyte imbalances or heart failure. Mannitol, an osmotic diuretic, was also studied for this purpose, but such studies have been heavily questioned. Diuretics, drugs that increase urine output to reduce excessive fluid in the system, may be used to treat high intracranial pressures, but may cause hypovolemia (insufficient blood volume). Hyperventilation (larger and/or faster breaths) reduces carbon dioxide levels and causes blood vessels to constrict; this decreases blood flow to the brain and reduces ICP, but it potentially causes ischemia and is therefore only used in the short term. Endotracheal intubation and mechanical ventilation may be used to ensure proper oxygen supply and provide a secure airway. Hypotension (low blood pressure), which has a devastating outcome in TBI, can be prevented by giving intravenous fluids to maintain a normal blood pressure. Failing to maintain blood pressure can result in inadequate blood flow to the brain. Blood pressure may be kept at an artificially high level under controlled conditions by infusion of norepinephrine or similar drugs; this helps maintain cerebral perfusion. Body temperature is carefully regulated because increased temperature raises the brain's metabolic needs, potentially depriving it of nutrients. Seizures are common. While they can be treated with benzodiazepines, these drugs are used carefully because they can depress breathing and lower blood pressure. TBI patients are more susceptible to side effects and may react adversely or be inordinately sensitive to some pharmacological agents. During treatment monitoring continues for signs of deterioration such as a decreasing level of consciousness. Surgery can be performed on mass lesions or to eliminate objects that have penetrated the brain. Mass lesions such as contusions or hematomas causing a significant mass effect (shift of intracranial structures) are considered emergencies and are removed surgically. For intracranial hematomas, the collected blood may be removed using suction or forceps or it may be floated off with water. Surgeons look for hemorrhaging blood vessels and seek to control bleeding. In penetrating brain injury, damaged tissue is surgically debrided, and craniotomy may be needed. Craniotomy, in which part of the skull is removed, may be needed to remove pieces of fractured skull or objects embedded in the brain. Decompressive craniectomy (DC) is performed routinely in the very short period following TBI during operations to treat hematomas; part of the skull is removed temporarily (primary DC). DC performed hours or days after TBI in order to control high intracranial pressures (secondary DC) has not been shown to improve outcome in some trials and may be associated with severe side effects. Supervised physical therapy may be helpful to overcome some symptoms. Once medically stable, patients may be transferred to a subacute nursing unit of the medical center or to an independent rehabilitation hospital. After discharge from the inpatient rehabilitation treatment unit, care may be given on an outpatient basis. Respite care, including day centers and leisure facilities for the disabled, offers time off for caregivers and activities for people with TBI. People with TBI who cannot live independently or with family may be cared for in supported living facilities such as group homes. People who cannot return to regular employment may be given vocational rehabilitation; this supportive employment matches job demands to the worker's abilities. Rehabilitation aims to improve independent function at home and in society and to help adapt to disabilities or change living conditions to accommodate impairments and has demonstrated its general effectiveness, when conducted by a team of specialists, in head trauma. As for any patient with neurologic deficits, a multidisciplinary approach is key to limiting and overcoming disability. Neurologists will be the main physicians involved, but depending on the symptom, doctors of other medical specialties may also be helpful. Allied treatments such as physiotherapy, speech and language therapy or occupational therapy can also help to manage some symptoms and maintain quality of life. Treatment of neuropsychiatric symptoms such as emotional distress and clinical depression may involve mental health professionals such as therapists, psychologists, and psychiatrists, while neuropsychologists can help to evaluate and manage cognitive deficits. Pharmacological treatment can help to manage psychiatric or behavioral problems. Medication is also used to control post-traumatic epilepsy; however the the preventive use of anti-epileptics is not recommended. In those cases where the person is bedridden due to a reduction of consciousness, has to remain in a wheelchair because of mobility problems, or has any other problem heavily impacting self-caring capacities, caregiving and nursing are critical. Prognosis differs depending on the lesion type. Subarachnoid hemorrhage approximately doubles mortality. Subdural hematoma is associated with worse outcome and increased mortality, while people with epidural hematoma are expected to have a good outcome if they receive surgery quickly. Diffuse axonal injury is often associated with coma and poor outcome. Medical complications are associated with a bad prognosis. Examples are hypotension (low blood pressure), hypoxia (low blood oxygen saturation), lower cerebral perfusion pressures and longer times spent with high intracranial pressures. Patient characteristics also influence prognosis. Factors thought to worsen it include abuse of substances such as illicit drugs and alcohol and age over sixty or under two years (in children, younger age at time of injury may be associated with a slower recovery of some abilities). Improvement of neurological function usually occurs for two or more years after the trauma but is fastest during the first six months. Children recover better in the immediate time frame and improve for longer periods. Complications are distinct medical problems that may arise as a result of the TBI. The results of traumatic brain injury vary widely in type and duration; they include physical, cognitive, emotional, and behavioral complications. TBI can cause prolonged or permanent effects on consciousness, such as coma, brain death, persistent vegetative state (in which awake patients are unaware of their surroundings), and minimally conscious state (in which patients show minimal signs of being aware of self or environment). Lying still for long periods can cause complications including pressure sores, pneumonia or other infections, progressive multiple organ failure, and deep venous thrombosis, which can cause pulmonary embolism. Infections that can follow skull fractures and penetrating injuries include meningitis and abscesses. Complications involving the blood vessels include vasospasm, in which vessels constrict and restrict blood flow, the formation of aneurysms, in which the side of a vessel weakens and balloons out, and stroke. Movement disorders that may develop after TBI include tremor, ataxia (uncoordinated muscle movements), myoclonus (shock-like contractions of muscles), and Parkinson's disease. The risk of post-traumatic seizures increases with severity of trauma (image at right) and is particularly elevated with certain types of brain trauma such as cerebral contusions or hematomas. People with early seizures, those occurring within a week of injury, have an increased risk of post-traumatic epilepsy (recurrent seizures occurring more than a week after the initial trauma). People may lose or experience altered vision, hearing, or smell. Cognitive deficits that can follow TBI include impaired attention; disrupted insight, judgement, and thought; reduced processing speed; distractibility; and deficits in executive functions such as abstract reasoning, planning, problem-solving, and multitasking. Memory loss, the most common cognitive impairment among head-injured people, occurs in 20–79% of people with closed head trauma, depending on severity. People who have suffered TBI may also have difficulty with understanding or producing spoken or written language, or with more subtle aspects of communication such as body language. Post-concussion syndrome, a set of lasting symptoms experienced after mild TBI, can include physical, cognitive, emotional and behavioral problems such as headaches, dizziness, difficulty concentrating, and depression. Multiple TBIs may have a cumulative effect. A young person who receives a second concussion before symptoms from another one have healed may be at risk for developing a very rare but deadly condition called second-impact syndrome, in which the brain swells catastrophically after even a mild blow, with debilitating or deadly results. About one in five career boxers is affected by chronic traumatic brain injury (CTBI), which causes cognitive, behavioral, and physical impairments. Dementia pugilistica, the severe form of CTBI, primarily affects career boxers years after a boxing career. It commonly manifests as dementia, memory problems, and parkinsonism (tremors and lack of coordination). TBI may cause emotional or behavioral problems and changes in personality. These may include emotional instability, depression, anxiety, hypomania, mania, apathy, irritability, and anger. TBI appears to predispose a person to psychiatric disorders including obsessive compulsive disorder, alcohol or substance abuse or dependence, dysthymia, clinical depression, bipolar disorder, phobias, panic disorder, and schizophrenia. Behavioral symptoms that can follow TBI include disinhibition, inability to control anger, impulsiveness, lack of initiative, inappropriate sexual activity, and changes in personality. Different behavioral problems are characteristic of the location of injury; for instance, frontal lobe injuries often result in disinhibition and inappropriate or childish behavior, and temporal lobe injuries often cause irritability and aggression. The incidence of TBI is increasing globally, largely due to an increase in motor vehicle use in low- and middle-income countries. In developing countries, automobile use has increased faster than safety infrastructure could be introduced. In contrast, vehicle safety laws have decreased rates of TBI in high-income countries, which have seen decreases in traffic-related TBI since the 1970s. Each year in the United States about two million people suffer a TBI and about 500,000 are hospitalized. The yearly incidence of TBI is estimated at 180–250 per 100,000 people in the US, 281 per 100,000 in France, 361 per 100,000 in South Africa, 322 per 100,000 in Australia, and 430 per 100,000 in England. In the European Union the yearly aggregate incidence of TBI hospitalizations and fatalities is estimated at 235 per 100,000. TBI is present in 85% of traumatically injured children, either alone or with other injuries. 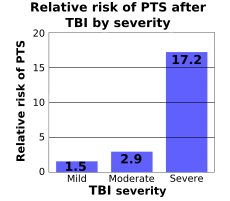 The greatest number of TBIs occur in people aged 15–24. Because TBI is more common in young people, its costs to society are high due to the loss of productive years to death and disability. The age groups most at risk for TBI are children ages five to nine and adults over age 80, and the highest rates of death and hospitalization due to TBI are in people over age 65. The incidence of fall-related TBI in First World countries is increasing as the population ages; thus the median age of people with head injuries has increased. Regardless of age, TBI rates are higher in males. Men suffer twice as many TBIs as women do and have a fourfold risk of fatal head injury, and males account for two thirds of childhood and adolescent head trauma. However, when matched for severity of injury, women appear to fare more poorly than men. Socioeconomic status also appears to affect TBI rates; people with lower levels of education and employment and lower socioeconomic status are at greater risk. In the US, the mortality (death rate) rate is estimated to be 21% by 30 days after TBI. A study on Iraq War soldiers found that severe TBI carries a mortality of 30–50%. Deaths have declined due to improved treatments and systems for managing trauma in societies wealthy enough to provide modern emergency and neurosurgical services. The fraction of those who die after being hospitalized with TBI fell from almost half in the 1970s to about a quarter at the beginning of the 21st century. This decline in mortality has led to a concomitant increase in the number of people living with disabilities that result from TBI. Medieval and Renaissance surgeons continued the practice of trepanation for head injury. In the Middle Ages, physicians further described head injury symptoms and the term concussion became more widespread. Concussion symptoms were first described systematically in the 16th century by Berengario da Carpi. It was first suggested in the 18th century that intracranial pressure rather than skull damage was the cause of pathology after TBI. This hypothesis was confirmed around the end of the 19th century, and opening the skull to relieve pressure was then proposed as a treatment. In the 19th century it was noted that TBI is related to the development of psychosis. At that time a debate arose around whether post-concussion syndrome was due to a disturbance of the brain tissue or psychological factors. The debate continues today. In 1848, a railroad worker named Phineas Gage was in an explosives accident that drove an iron rod through his frontal lobe. Previously a restrained, capable man, Gage underwent a dramatic personality change after the injury; he became childish, vulgar, inappropriate and impulsive. Gage's case gave insight into the critical role played by the frontal lobe in personality and behavior and advanced the understanding of the relationship between the brain and the mind. The 20th century saw the advancement of technologies that improved treatment and diagnosis such as the development of imaging tools including CT and MRI. The introduction of intracranial pressure monitoring in the 1950s has been credited with beginning the "modern era" of head injury. Until the 20th century, the mortality rate of TBI was high and rehabilitation was uncommon; improvements in care made during World War I reduced the death rate and made rehabilitation possible. Facilities dedicated to TBI rehabilitation were probably first established during World War I. Explosives used in World War I caused many blast injuries; the large number of TBIs that resulted allowed researchers to learn about localization of brain functions. In the 1970s awareness of TBI as a public health problem grew, and a great deal of progress has been made since then in brain trauma research, such as the discovery of primary and secondary brain injury. The 1990s saw the development and dissemination of standardized guidelines for treatment of TBI, with protocols for a range of issues such as drugs and management of intracranial pressure. Research since the early 1990s has improved TBI survival; that decade was known as the "Decade of the Brain" for advances made in brain research. No medication exists to halt the progression of secondary injury, but the variety of pathological events presents opportunities to find treatments that interfere with the damage processes. Neuroprotection, methods to halt or mitigate secondary injury, have been the subject of great interest for their ability to limit the damage that follows TBI. However, clinical trials to test agents that could halt these cellular mechanisms have largely met with failure. For example, interest existed in hypothermia, cooling the injured brain to limit TBI damage, but clinical trials showed that it is not useful in the treatment of TBI. In addition, drugs such as NMDA receptor antagonists to halt neurochemical cascades such as excitotoxicity showed promise in animal trials but failed in clinical trials. These failures could be due to factors including faults in the trials' design or in the insufficiency of a single agent to prevent the array of injury processes involved in secondary injury. Developments in technologies may provide doctors with valuable medical information. For example, work has been done to design a device to monitor oxygenation that could be attached to a probe placed into the brain—such probes are currently used to monitor ICP. Research is also planned to clarify factors correlated to outcome in TBI and to determine in which cases it is best to perform CT scans and surgical procedures. Hyperbaric oxygen therapy (HBO) has been evaluated as an adjunctive treatment following TBI concluding a Cochrane review that its use could not be justified. HBO for TBI has remained controversial as studies have looked for improvement mechanisms, and further evidence shows that it may have potential as a treatment. ^ a b Rehman T, Ali R, Tawil I, Yonas H (2008). "Rapid progression of traumatic bifrontal contusions to transtentorial herniation: A case report". Cases journal 1 (1): 203. doi:10.1186/1757-1626-1-203. PMID 18831756. PMC: 2566562. http://www.casesjournal.com/content/1/1/203. ^ a b c d e f g h i j k l m n o p q r s t u v w x y Maas AI, Stocchetti N, Bullock R (August 2008). "Moderate and severe traumatic brain injury in adults". Lancet Neurology 7 (8): 728–41. doi:10.1016/S1474-4422(08)70164-9. PMID 18635021. ^ a b c d e f g h i j k l m n o Parikh S, Koch M, Narayan RK (2007). "Traumatic brain injury". International Anesthesiology Clinics 45 (3): 119–35. doi:10.1097/AIA.0b013e318078cfe7. PMID 17622833. ^ Chapman SB, Levin HS, Lawyer SL (1999). "Communication problems resulting from brain injury in children: Special issues of assessment and management". in McDonald S, Togher L, Code C. Communication Disorders Following Traumatic Brain Injury. East Sussex: Psychology Press. pp. 235–36. ISBN 0-86377-724-4. http://books.google.com/books?id=klwVAAAAIAAJ&pg=PA236&dq=non-traumatic+%22Acquired+brain+injury&client=firefox-a. Retrieved on 2008-11-13. ^ a b Collins C, Dean J (2002). "Acquired brain injury". in Turner A, Foster M, Johnson SE. Occupational Therapy and Physical Dysfunction: Principles, Skills and Practice. Edinburgh: Churchill Livingstone. pp. 395–96. ISBN 0-443-06224-2. http://books.google.com/books?id=z2sA3mnG_zUC&pg=PA395&dq=non-traumatic+%22Acquired+brain+injury&client=firefox-a. Retrieved on 2008-11-13. ^ a b Blissitt PA (September 2006). "Care of the critically ill patient with penetrating head injury". Critical Care Nursing Clinics of North America 18 (3): 321–32. doi:10.1016/j.ccell.2006.05.006. PMID 16962454. ^ a b c d e f g h i Hannay HJ, Howieson DB, Loring DW, Fischer JS, Lezak MD (2004). "Neuropathology for neuropsychologists". in Lezak MD, Howieson DB, Loring DW. Neuropsychological Assessment. Oxford [Oxfordshire]: Oxford University Press. pp. 158–62. ISBN 0-19-511121-4. ^ a b c Jennett B (May 1998). "Epidemiology of head injury". Archives of Disease in Childhood 78 (5): 403–06. doi:10.1136/adc.78.5.403. PMID 9659083. PMC: 1717568. http://adc.bmj.com/cgi/content/full/78/5/403. ^ Weber JT, Maas AIR (2007). Weber JT. ed. Neurotrauma: New Insights Into Pathology and Treatment. Amsterdam: Academic Press. p. xi. ISBN 0444530177. http://books.google.com/books?id=FyzEQPKUuPcC&pg=PP1&dq=neurotrauma&client=firefox-a&sig=rMCcbEcUwojhorMEC3D9Bd4eqUo#PPA14,M1. Retrieved on 2008-11-12. ^ a b c d Saatman KE, Duhaime AC et al. Workshop Scientific Team and Advisory Panel Members (2008). "Classification of traumatic brain injury for targeted therapies". Journal of Neurotrauma 25 (7): 719–38. doi:10.1089/neu.2008.0586. PMID 18627252. ^ a b c d e f Rao V, Lyketsos C (2000). "Neuropsychiatric sequelae of traumatic brain Injury". Psychosomatics 41 (2): 95–103. doi:10.1176/appi.psy.41.2.95. PMID 10749946. ^ a b c d e f g h i j k l m n o p Valadka AB (2004). "Injury to the cranium". in Moore EJ, Feliciano DV, Mattox KL. Trauma. New York: McGraw-Hill, Medical Pub. Division. pp. 385–406. ISBN 0-07-137069-2. http://books.google.com/books?id=VgizxQg-8QQC&pg=PA385. Retrieved on 2008-08-15. ^ Hayden MG, Jandial R, Duenas HA, Mahajan R, Levy M (2007). "Pediatric concussions in sports: A simple and rapid assessment tool for concussive injury in children and adults". Child's Nervous System 23 (4): 431–435. doi:10.1007/s00381-006-0277-2. PMID 17219233. ^ Seidenwurm DI (2007). "Introduction to brain imaging". in Brant WE, Helms CA. Fundamentals of Diagnostic Radiology. Philadelphia: Lippincott, Williams & Wilkins. pp. 53–55. ISBN 0-7817-6135-2. http://books.google.com/books?id=Sossht2t5XwC&pg=PA53&lpg=PA53&dq=extra-axial+intra-axial&source=bl&ots=kjBGvw7ZQ5&sig=7qcOUbeotBFhrvrkgtCz5oasMEo&hl=en&sa=X&oi=book_result&resnum=1&ct=result. Retrieved on 2008-11-17. ^ a b c Smith DH, Meaney DF, Shull WH (2003). "Diffuse axonal injury in head trauma". Journal of Head Trauma Rehabilitation 18 (4): 307–16. doi:10.1097/00001199-200307000-00003. PMID 16222127. ^ Melvin JW, Lighthall JW (2002). Nahum AM, Melvin JW. ed. Accidental Injury: Biomechanics and Prevention. Berlin: Springer. pp. 280–81. ISBN 0-387-98820-3. http://books.google.com/books?id=Y4l5fopEI0EC&pg=PA280&dq=focal+diffuse+brain+injury&client=firefox-a. Retrieved on 2008-11-15. ^ Basso A, Scarpa MT (December 1990). "Traumatic aphasia in children and adults: a comparison of clinical features and evolution". Cortex 26 (4): 501–14. PMID 1706973. ^ Mohr JP, Weiss GH, Caveness WF, et al (December 1980). "Language and motor disorders after penetrating head injury in Viet Nam". Neurology 30 (12): 1273–9. PMID 7192808. ^ a b c d e f g h Hardman JM, Manoukian A (2002). "Pathology of head trauma". Neuroimaging Clinics of North America 12 (2): 175–87, vii. doi:10.1016/S1052-5149(02)00009-6. PMID 12391630. "TBI is highest in young adults aged 15 to 24 years and higher in men than women in all age groups.". ^ a b Barkley JM, Morales D, Hayman LA, Diaz-Marchan PJ (2006). "Static neuroimaging in the evaluation of TBI". in Zasler ND, Katz DI, Zafonte RD. Brain Injury Medicine: Principles and Practice. Demos Medical Publishing. pp. 140–43. ISBN 1-888799-93-5. http://books.google.com/books?id=yplFkKimNcYC&pg=PA134&lpg=PA134&dq=define+Intra-axial+hematoma&source=web&ots=9XsNbubP_E&sig=-BW93XfLYNx8YuNVg3HE3QqT4tg&hl=en&sa=X&oi=book_result&resnum=10&ct=result#PPA140,M1. ^ a b Arlinghaus KA, Shoaib AM, Price TRP (2005). "Neuropsychiatric assessment". in Silver JM, McAllister TW, Yudofsky SC. Textbook Of Traumatic Brain Injury. Washington, DC: American Psychiatric Association. pp. 63–65. ISBN 1-58562-105-6. ^ a b c d e "NINDS Traumatic Brain Injury Information Page". National Institute of Neurological Disorders and Stroke. 2008-09-15. http://www.ninds.nih.gov/disorders/tbi/tbi.htm. Retrieved on 2008-10-27. ^ a b Kushner D (1998). "Mild traumatic brain injury: Toward understanding manifestations and treatment". Archives of Internal Medicine 158 (15): 1617–24. doi:10.1001/archinte.158.15.1617. PMID 9701095. http://archinte.highwire.org/cgi/content/full/158/15/1617. ^ a b c d e f g h Ghajar J (September 2000). "Traumatic brain injury". Lancet 356 (9233): 923–29. doi:10.1016/S0140-6736(00)02689-1. PMID 11036909. ^ a b c d e f g Salomone JP, Frame SB (2004). "Prehospital care". in Moore EJ, Feliciano DV, Mattox KL. Trauma. New York: McGraw-Hill, Medical Pub. Division. pp. 117–8. ISBN 0-07-137069-2. http://books.google.com/books?id=VgizxQg-8QQC&pg=PA545&dq=tracheobronchial&client=firefox-a&sig=ATbisz-qr_r2zxfALuU6LnKYdYI#PPA544,M1. Retrieved on 2008-08-15. ^ a b "Signs and Symptoms". Centers for Disease Control and Prevention, National Center for Injury Prevention and Control. 2007-07-07. http://www.cdc.gov/ncipc/tbi/Signs_and_Symptoms.htm. Retrieved on 2008-10-27. ^ Langlois JA, Rutland-Brown W, Wald MM (2006). "The epidemiology and impact of traumatic brain injury: A brief overview". Journal of Head Trauma Rehabilitation 21 (5): 375–8. doi:10.1097/00001199-200609000-00001. PMID 16983222. ^ a b Reilly P (2007). "The impact of neurotrauma on society: An international perspective". in Weber JT. Neurotrauma: New Insights Into Pathology and Treatment. Amsterdam: Academic Press. pp. 5–7. ISBN 0444530177. http://books.google.com/books?id=FyzEQPKUuPcC&pg=PP1&dq=neurotrauma&client=firefox-a&sig=rMCcbEcUwojhorMEC3D9Bd4eqUo#PPA14,M1. Retrieved on 2008-11-10. ^ a b c d "Traumatic brain injury". Centers for Disease Control and Prevention, National Center for Injury Prevention and Control. 2007. http://www.cdc.gov/ncipc/factsheets/tbi.htm. Retrieved on 2008-10-28. ^ Hunt JP, Weintraub SL, Wang YZ, Buetcher KJ (2004). "Kinematics of trauma". in Moore EJ, Feliciano DV, Mattox KL. Trauma. New York: McGraw-Hill, Medical Pub. Division. p. 153. ISBN 0-07-137069-2. http://books.google.com/books?id=VgizxQg-8QQC&pg=PA545&dq=tracheobronchial&client=firefox-a&sig=ATbisz-qr_r2zxfALuU6LnKYdYI#PPA544,M1. Retrieved on 2008-08-15. ^ a b Elovic E, Zafonte R (2005). "Prevention". in Silver JM, McAllister TW, Yudofsky SC. Textbook of Traumatic Brain Injury. Washington, DC: American Psychiatric Association. p. 740. ISBN 1-58562-105-6. ^ Bay E, McLean SA (February 2007). "Mild traumatic brain injury: An update for advanced practice nurses". Journal of Neuroscience Nursing 39 (1): 43–51. PMID 17396538. ^ a b Comper P, Bisschop SM, Carnide N, et al. (2005). "A systematic review of treatments for mild traumatic brain injury". Brain Injury 19 (11): 863–880. doi:10.1080-0269050400025042 (inactive 2009-04-11). PMID 16296570. ^ The Lancet, (December 2007). "Grappling with traumatic brain injury". Lancet 370 (9603): 1879. doi:10.1016/S0140-6736(07)61785-1. PMID 18068492. ^ a b c d e f g h i j Park E, Bell JD, Baker AJ (April 2008). "Traumatic brain injury: Can the consequences be stopped?". Canadian Medical Association Journal 178 (9): 1163–70. doi:10.1503/cmaj.080282. PMID 18427091. ^ American Academy of Pediatrics: Committee on Child Abuse and Neglect (July 2001). "Shaken baby syndrome: Rotational cranial injuries. Technical report". Pediatrics 108 (1): 206–10. doi:10.1542/peds.108.1.206. PMID 11433079. http://pediatrics.aappublications.org/cgi/content/full/108/1/206. ^ Morrison AL, King TM, Korell MA, Smialek JE, Troncoso JC (1998). "Acceleration-deceleration injuries to the brain in blunt force trauma". American Journal of Forensic Medical Pathology 19 (2): 109–112. doi:10.1097/00000433-199806000-00002. PMID 9662103. http://meta.wkhealth.com/pt/pt-core/template-journal/lwwgateway/media/landingpage.htm?issn=0195-7910&volume=19&issue=2&spage=109. ^ Poirier MP (2003). "Concussions: Assessment, management, and recommendations for return to activity (abstract)". Clinical Pediatric Emergency Medicine 4 (3): 179–185. doi:10.1016/S1522-8401(03)00061-2. ^ Sauaia A, Moore FA, Moore EE, et al. (February 1995). "Epidemiology of trauma deaths: A reassessment". The Journal of Trauma 38 (2): 185–93. doi:10.1097/00005373-199502000-00006. PMID 7869433. ^ a b Narayan RK, Michel ME, Ansell B, et al. (May 2002). "Clinical trials in head injury". Journal of Neurotrauma 19 (5): 503–57. doi:10.1089/089771502753754037. PMID 12042091. ^ Xiong Y, Lee CP, Peterson PL (2000). "Mitochondrial dysfunction following traumatic brain injury". in Miller LP and Hayes RL, eds. Co-edited by Newcomb JK. Head Trauma: Basic, Preclinical, and Clinical Directions. New York: John Wiley and Sons, Inc.. pp. 257–80. ISBN 0-471-36015-5. ^ Scalea TM (2005). "Does it matter how head injured patients are resuscitated?". in Valadka AB, Andrews BT. Neurotrauma: Evidence-based Answers to Common Questions. Thieme. pp. 3–4. ISBN 3131307811. ^ Morley EJ, Zehtabchi S (September 2008). "Mannitol for traumatic brain injury: Searching for the evidence". Annals of Emergency Medicine 52 (3): 298–300. doi:10.1016/j.annemergmed.2007.10.013. PMID 18763356. ^ a b c d e f g h i j k Zink BJ (March 2001). "Traumatic brain injury outcome: Concepts for emergency care". Annals of Emergency Medicine 37 (3): 318–32. doi:10.1067/mem.2001.113505. PMID 11223769. ^ a b Barr RM, Gean AD, Le TH (2007). "Craniofacial trauma". in Brant WE, Helms CA. Fundamentals of Diagnostic Radiology. Philadelphia: Lippincott, Williams & Wilkins. p. 55. ISBN 0-7817-6135-2. http://books.google.com/books?id=Sossht2t5XwC&pg=PA53&lpg=PA53&dq=extra-axial+intra-axial&source=bl&ots=kjBGvw7ZQ5&sig=7qcOUbeotBFhrvrkgtCz5oasMEo&hl=en&sa=X&oi=book_result&resnum=1&ct=result. Retrieved on 2008-11-17. ^ Coles JP (July 2007). "Imaging after brain injury". British Journal of Anaesthesia 99 (1): 49–60. doi:10.1093/bja/aem141. PMID 17573394. http://bja.oxfordjournals.org/cgi/pmidlookup?view=long&pmid=17573394. ^ Liu BC, Ivers R, Norton R, Boufous S, Blows S, Lo SK (2008). "Helmets for preventing injury in motorcycle riders". Cochrane Database Syst Rev (3): CD004333. doi:10.1002/14651858.CD004333.pub3. PMID 18254047. ^ McCrory PR (August 2003). "Brain injury and heading in soccer". BMJ 327 (7411): 351–52. doi:10.1136/bmj.327.7411.351. PMID 12919964. PMC: 1126775. http://www.bmj.com/cgi/content/full/327/7411/351?etoc. ^ a b McIntosh AS, McCrory P (June 2005). "Preventing head and neck injury". British Journal of Sports Medicine (Free registration required) 39 (6): 314–18. doi:10.1136/bjsm.2005.018200. PMID 15911597. PMC: 1725244. http://bjsm.bmj.com/cgi/content/full/39/6/314. ^ a b c Crooks CY, Zumsteg JM, Bell KR (November 2007). "Traumatic brain injury: A review of practice management and recent advances". Physical Medicine and Rehabilitation Clinics of North America 18 (4): 681–710. doi:10.1016/j.pmr.2007.06.005. PMID 17967360. ^ Hahn RA, Bilukha O, Crosby A, et al (February 2005). "Firearms laws and the reduction of violence: a systematic review". Am J Prev Med 28 (2 Suppl 1): 40–71. doi:10.1016/j.amepre.2004.10.005. PMID 15698747. ^ a b c d e f g h i j k l Office of Communications and Public Liaison (2002). "Traumatic brain injury: Hope through research". NIH Publication No. 02-2478. National Institute of Neurological Disorders and Stroke, National Institutes of Health. http://www.ninds.nih.gov/disorders/tbi/detail_tbi.htm. Retrieved on 2008-08-17. ^ a b Greenwald BD, Burnett DM, Miller MA (March 2003). "Congenital and acquired brain injury. 1. Brain injury: epidemiology and pathophysiology". Archives of Physical Medicine and Rehabilitation 84 (3 Suppl 1): S3–7. doi:10.1016/j.apmr.2007.12.001. PMID 12708551. ^ Gruen P (May 2002). "Surgical management of head trauma". Neuroimaging Clinics of North America 12 (2): 339–43. doi:10.1016/S1052-5149(02)00013-8. PMID 12391640. ^ Cruz J, Minoja G, Okuchi K (October 2001). "Improving clinical outcomes from acute subdural hematomas with the emergency preoperative administration of high doses of mannitol: A randomized trial". Neurosurgery 49 (4): 864–71. doi:10.1097/00006123-200110000-00016. PMID 11564247. ^ Cruz J, Minoja G, Okuchi K (September 2002). "Major clinical and physiological benefits of early high doses of mannitol for intraparenchymal temporal lobe hemorrhages with abnormal pupillary widening: A randomized trial". Neurosurgery 51 (3): 628–37; discussion 637–38. doi:10.1097/00006123-200209000-00006. PMID 12188940. ^ Cruz J, Minoja G, Okuchi K, Facco E (March 2004). "Successful use of the new high-dose mannitol treatment in patients with Glasgow Coma Scale scores of 3 and bilateral abnormal pupillary widening: A randomized trial". Journal of Neurosurgery 100 (3): 376–83. PMID 15035271. ^ Roberts I, Smith R, Evans S (February 2007). "Doubts over head injury studies". British Medical Journal 334 (7590): 392–94. doi:10.1136/bmj.39118.480023.BE. PMID 17322250. PMC: 1804156. http://www.bmj.com/cgi/content/full/334/7590/392. ^ Curry, Rebecca; Hollingworth, Will;Ellenbogen, Richard G;Vavilala, Monica S (2008). "Incidence of hypo- and hypercarbia in severe traumatic brain injury before and after 2003 pediatric guidelines". Pediatric Critical Care Medicine (Lippincott Williams & Wilkins) 9 (2): 141–146. doi:10.1097/PCC.0B013e318166870e. ^ Tasker, RC (2008). "Head and spinal cord trauma". in Nichols DG. Roger's Textbook of Pediatric Intensive Care (4th ed.). PA: Lippincott Williams & Wilkins. pp. 887–911. ISBN 9780781782753. ^ a b c d e f g h i Marshall LF (September 2000). "Head injury: Recent past, present, and future". Neurosurgery 47 (3): 546–61. doi:10.1097/00006123-200009000-00002. PMID 10981741. ^ Strategies for Managing Multisystem Disorders. Hagerstwon, MD: Lippincott Williams & Wilkins. 2005. p. 370. ISBN 1-58255-423-4. http://books.google.com/books?id=SPPiZWC8FpEC&pg=PA365&dq=%22traumatic+brain+injury%22+accident+sports&lr=#PPA370,M1. ^ a b Dunn IF, Ellegala DB (2008). "Decompressive hemicraniectomy in the management of severe traumatic brain injury". in Bhardwaj A, Ellegala DB, Kirsch JR. Acute Brain and Spinal Cord Injury: Evolving Paradigms and Management. Informa Health Care. pp. 1–2. ISBN 1420047949. ^ a b c McMillan TM, Oddy M (2000). "Service provision for social disability and handicap after acquired brain injury". in Wood RL, McMillan TM. Neurobehavioural Disability and Social Handicap Following Traumatic Brain Injury. East Sussex: Psychology Press. pp. 267–68. ISBN 0-86377-889-5. ^ Turner-Stokes L, Disler PB, Nair A, Wade DT (2005). "Multi-disciplinary rehabilitation for acquired brain injury in adults of working age". Cochrane Database of Systematic Reviews (3): CD004170. doi:10.1002/14651858.CD004170.pub2. PMID 16034923. ^ Deb S, Crownshaw T (January 2004). "The role of pharmacotherapy in the management of behaviour disorders in traumatic brain injury patients". Brain Injury 18 (1): 1–31. doi:10.1080/0269905031000110463. PMID 14660233. ^ Agrawal A, Timothy J, Pandit L, Manju M (July 2006). "Post-traumatic epilepsy: An overview". Clin Neurol Neurosurg 108 (5): 433–9. doi:10.1016/j.clineuro.2005.09.001. PMID 16225987. ^ a b Brown AW, Elovic EP, Kothari S, Flanagan SR, Kwasnica C (March 2008). "Congenital and acquired brain injury. 1. Epidemiology, pathophysiology, prognostication, innovative treatments, and prevention". Archives of Physical Medicine and Rehabilitation 89 (3 Supplement 1): S3–8. doi:10.1016/j.apmr.2007.12.001. PMID 18295647. ^ a b Frey LC (2003). "Epidemiology of posttraumatic epilepsy: A critical review". Epilepsia 44 (Supplement 10): 11–17. doi:10.1046/j.1528-1157.44.s10.4.x. PMID 14511389. http://www.blackwell-synergy.com/doi/full/10.1046/j.1528-1157.44.s10.4.x?prevSearch=allfield%3A%28concussive%29. ^ Armin SS, Colohan AR, Zhang JH (June 2006). "Traumatic subarachnoid hemorrhage: Our current understanding and its evolution over the past half century". Neurological Research 28 (4): 445–52. doi:10.1179/016164106X115053. PMID 16759448. ^ Persistent vegetative state at Dorland's Medical Dictionary. ^ Schiff ND, Plum F, Rezai AR (March 2002). "Developing prosthetics to treat cognitive disabilities resulting from acquired brain injuries". Neurological Research 24 (2): 116–24. doi:10.1179/016164102101199576. PMID 11877893. ^ a b Kwasnica C, Brown AW, Elovic EP, Kothari S, Flanagan SR (March 2008). "Congenital and acquired brain injury. 3. Spectrum of the acquired brain injury population". Archives of Physical Medicine and Rehabilitation 89 (3 Suppl 1): S15–20. doi:10.1016/j.apmr.2007.12.006. PMID 18295644. ^ Agrawal A, Timothy J, Pandit L, Manju M (2006). "Post-traumatic epilepsy: An overview". Clinical Neurology and Neurosurgery 108 (5): 433–439. doi:10.1016/j.clineuro.2005.09.001. PMID 16225987. ^ Folzer SM (2001). "Psychotherapy with "mild" brain-injured patients". American Journal of Orthopsychiatry 71 (2): 245–51. doi:10.1037/0002-9432.71.2.245. PMID 11347365. ^ a b c d León-Carrión J, Domínguez-Morales Mdel R, Barroso y Martín JM, Murillo-Cabezas F (2005). "Epidemiology of traumatic brain injury and subarachnoid hemorrhage". Pituitary 8 (3-4): 197–202. doi:10.1007/s11102-006-6041-5. PMID 16508717. ^ Alves OL, Bullock R (2001). "Excitotoxic damage in traumatic brain injury". in Clark RSB, Kochanek P. Brain injury. Boston: Kluwer Academic Publishers. p. 1. ISBN 0-7923-7532-7. http://books.google.com/books?id=uRR4jKhF_iUC&pg=PA1&dq=Traumatic+brain+injury+causes&client=firefox-a#PPA6,M1. Retrieved on 2008-11-28. ^ Coma at Dorland's Medical Dictionary. ^ Cassidy JD, Carroll LJ, Peloso PM, Borg J, von Holst H, Holm L, et al. (2004). "Incidence, risk factors and prevention of mild traumatic brain injury: Results of the WHO Collaborating Centre Task Force on Mild Traumatic Brain Injury". Journal of Rehabilitation Medicine 36 (Supplement 43): 28–60. doi:10.1080/16501960410023732. PMID 15083870. ^ a b c D'Ambrosio R, Perucca E (2004). "Epilepsy after head injury". Current Opinion in Neurology 17 (6): 731–735. doi:10.1097/00019052-200412000-00014. PMID 15542983. ^ Carli P, Orliaguet G (February 2004). "Severe traumatic brain injury in children". Lancet 363 (9409): 584–85. doi:10.1016/S0140-6736(04)15626-2. PMID 14987880. ^ Necajauskaite, O; Endziniene M, Jureniene K (2005). "The prevalence, course and clinical features of post-concussion syndrome in children" (PDF). Medicina (Kaunas) 41 (6): 457-64. PMID 15998982. http://medicina.kmu.lt/0506/0506-01e.pdf. ^ Chesnutt RM, Eisenberg JM (1999). "Introduction and background". Rehabilitation for Traumatic Brain Injury. p. 9. ISBN 0788183761. ^ Tolias C and Sgouros S (February 4, 2005). "Initial evaluation and management of CNS injury". eMedicine.com. http://www.emedicine.com/med/topic3216.htm. Retrieved on 2007-12-16. ^ a b c d Granacher (2007). p.1. ^ Scurlock JA, Andersen BR (2005). Diagnoses in Assyrian and Babylonian Medicine: Ancient Sources, Translations, and Modern Medical Analyses. Urbana: University of Illinois Press. p. 307. ISBN 0-252-02956-9. http://books.google.com/books?id=alBmzfP3cpoC&pg=PA306&dq=%22head+trauma%22+ancient&client=firefox-a#PPA304,M1. Retrieved on 2008-11-08. ^ Sanchez GM, Burridge AL (2007). "Decision making in head injury management in the Edwin Smith Papyrus". Neurosurgical Focus 23 (1): E5. doi:10.3171/foc.2007.23.1.5 (inactive 2009-04-11). PMID 17961064. ^ a b c Levin HS, Benton AL, Grossman R (1982). "Historical review of head injury". Neurobehavioral Consequences of Closed Head Injury. Oxford [Oxfordshire]: Oxford University Press. pp. 3–5. ISBN 0-19-503008-7. http://books.google.com/books?id=EJJVT4ntacAC&pg=PA4&dq=%22head+trauma%22+ancient&client=firefox-a#PPA3,M1. Retrieved on 2008-11-08. ^ a b Zillmer EA, Schneider J, Tinker J, Kaminaris CI (2006). "A history of sports-related concussions: A neuropsychological perspective". in Echemendia RJ. Sports Neuropsychology: Assessment and Management of Traumatic Brain Injury. New York: The Guilford Press. pp. 21–23. ISBN 1-57230-078-7. http://books.google.com/books?id=dsEspzWGVzMC&pg=PA21&dq=%22traumatic+brain+injury%22+hippocrates&client=firefox-a#PPA21,M1. Retrieved on 2008-10-31. ^ Corcoran C, McAlister TW, Malaspina D (2005). "Psychotic disorders". in Silver JM, McAllister TW, Yudofsky SC. Textbook Of Traumatic Brain Injury. Washington, DC: American Psychiatric Association. p. 213. ISBN 1-58562-105-6. http://books.google.com/books?id=3CuM6MviwMAC&printsec=frontcover&dq=tarumatic+brain+injury&client=firefox-a&sig=ACfU3U1rh8EoSUuJG6fLqtCl62M5B5Vxcw#PPA63,M1. Retrieved on 2008-11-08. ^ a b Harlow, J.M. (1868). "Recovery from the Passage of an Iron Bar through the Head." Publications of the Massachusetts Medical Society 2: 327-347. ^ Damasio H, Grabowski T, Frank R, Galaburda AM, Damasio AR (2004). 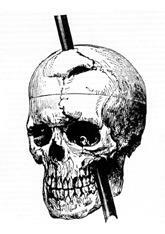 "The return of Phineas Gage: Clues about the brain from the skull of a famous patient". in Cacioppo JT, Berntson GC. Social Neuroscience: Key Readings. Psychology Press (UK). pp. 21–26. ISBN 1-84169-099-6. http://books.google.com/books?id=PqNs1L1SwPMC&pg=PA19&dq=Phineas+Gage&client=firefox-a#PPA21,M1. Retrieved on 2008-11-05. ^ O'Driscoll K, Leach JP (1998). ""No longer Gage": An iron bar through the head. Early observations of personality change after injury to the prefrontal cortex". British Medical Journal 317 (7174): 1673–4. PMID 9857119. PMC: 1114479. http://bmj.com/cgi/pmidlookup?view=long&pmid=9857119. ^ Jones E, Fear NT, Wessely S (November 2007). "Shell shock and mild traumatic brain injury: A historical review". The American Journal of Psychiatry 164 (11): 1641–5. doi:10.1176/appi.ajp.2007.07071180. PMID 17974926. http://ajp.psychiatryonline.org/cgi/content/full/164/11/1641. ^ Yates D, Aktar R, Hill J; Guideline Development Group. (2007). "Assessment, investigation, and early management of head injury: Summary of NICE guidance". British Medical Journal 335 (7622): 719–20. doi:10.1136/bmj.39331.702951.47. PMID 17916856. PMC: 2001047. http://www.bmj.com/cgi/content/full/335/7622/719. ^ Bennett MH, Trytko B, Jonker B (2004). "Hyperbaric oxygen therapy for the adjunctive treatment of traumatic brain injury". Cochrane Database of Systematic Reviews (4): CD004609. doi:10.1002/14651858.CD004609.pub2. PMID 15495120. ^ Barrett KF, Masel B, Patterson J, Scheibel RS, Corson KP, Mader JT (2004). "Regional CBF in chronic stable TBI treated with hyperbaric oxygen". Undersea & Hyperbaric Medicine: Journal of the Undersea and Hyperbaric Medical Society, Inc 31 (4): 395–406. PMID 15686271. http://archive.rubicon-foundation.org/4024. Retrieved on 2008-10-30. ^ Freiberger JJ, Suliman HB, Sheng H, McAdoo J, Piantadosi CA, Warner DS (February 2006). "A comparison of hyperbaric oxygen versus hypoxic cerebral preconditioning in neonatal rats". Brain Research 1075 (1): 213–22. doi:10.1016/j.brainres.2005.12.088. PMID 16458861. ^ Liu Z, Jiao QF, You C, Che YJ, Su FZ (June 2006). "Effect of hyperbaric oxygen on cytochrome C, Bcl-2 and Bax expression after experimental traumatic brain injury in rats". Chinese Journal of Traumatology (Zhonghua chuang shang za zhi), Chinese Medical Association 9 (3): 168–74. PMID 16723075. ^ Rockswold SB, Rockswold GL, Defillo A (March 2007). "Hyperbaric oxygen in traumatic brain injury". Neurological Research 29 (2): 162–72. doi:10.1179/016164107X181798. PMID 17439701. ^ Hardy P, Johnston KM, De Beaumont L, Montgomery DL, Lecomte JM, Soucy JP, Bourbonnais D, Lassonde M (February 2007). "Pilot case study of the therapeutic potential of hyperbaric oxygen therapy on chronic brain injury". Journal of the Neurological Sciences 253 (1-2): 94–105. doi:10.1016/j.jns.2006.12.005. PMID 17234213. Boake C, Diller L (2005). "History of rehabilitation for traumatic brain injury". in High WM, Sander AM, Struchen MA, Hart KA. Rehabilitation for Traumatic Brain Injury. Oxford [Oxfordshire]: Oxford University Press. ISBN 0-19-517355-4. http://books.google.com/books?id=AWxL26QinwYC&pg=PA3&dq=%22traumatic+brain+injury%22+century&client=firefox-a. Retrieved on 2008-11-06. Granacher RA (2007). Traumatic Brain Injury: Methods for Clinical & Forensic Neuropsychiatric Assessment, Second Edition. Boca Raton: CRC. ISBN 0-8493-8138-X. http://books.google.com/books?id=xt1YFydzXKQC&pg=PA1&dq=%22traumatic+brain+injury%22+century&client=firefox-a. Retrieved on 2008-11-14. LaPlaca MC, Simon CM, Prado GR, Cullen DR (2007). "CNS injury biomechanics and experimental models". in Weber JT. Neurotrauma: New Insights Into Pathology and Treatment. Amsterdam: Academic Press. ISBN 0444530177. http://books.google.com/books?id=FyzEQPKUuPcC&pg=PP1&dq=neurotrauma&client=firefox-a&sig=rMCcbEcUwojhorMEC3D9Bd4eqUo#PPA14,M1. Retrieved on 2008-11-10. Marion DW (1999). "Introduction". in Marion DW. Traumatic Brain Injury. Stuttgart: Thieme. ISBN 0-86577-727-6. http://books.google.com/books?id=wHS_97NyMsYC&printsec=frontcover&dq=Traumatic+brain+injury+causes&client=firefox-a#PPA3,M1. Retrieved on 2008-11-28. This page was last modified on 17 April 2009, at 02:52 (UTC).